In Werleshausen modern times have not pushed aside the old. A walk around the village with its evocative relics of past centuries will transport you back to a bygone age. Lovingly restored half-timbered houses give the village its character. In order to discover Werleshausen we suggest the following walk. The tour begins at "Bornhagener Straße". On this street you enter in Werleshausen. The next part of the walk leads you through the beautiful heart of the historical old village with the walled village square and the church ("Linde und Kirche"). The walled village square is shaded by lime trees and it is a meeting point for people. The walled village square is very old and was in the medieval times also a court place. The church steeple is also made of timber-framing. Below the church lies a brook called the "Siesterbach", a romantic place with ducks and geese. On the other side of the brook, you will find the old mill and the former dairy-farm dwelling. In the 20th century the dwelling was used as children's home until it burned down in 1985. The "Große Gasse" street connects church and manor. Here you will find large farm houses in a good state of preservation. The barns belonging to the farms were not destroyed as in other places. The oldest house was built in the second part of the 16th century. The next part takes you to the manor house or " Gutshof" and its grounds. 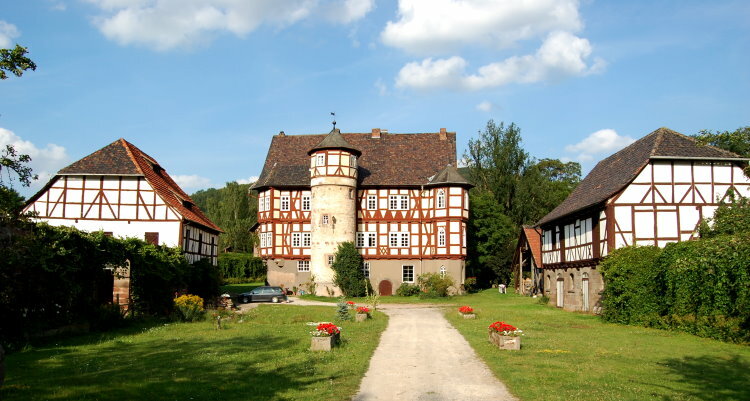 The manor house is the landmark of Werleshausen, it was rebuilt in 1556 after a fire from the knights of Hanstein castle. The manor is situated on "Am Rasen" street. 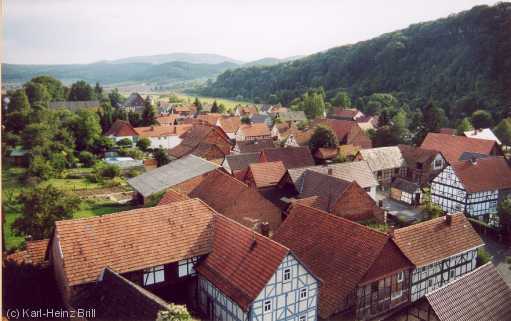 You will also find more half-timbered houses and a small fisherman's house. The tour ends at the Werra river. (Parking possible).